Steel Hanger Bolts available in diameters of: 1/4", 5/16" and 3/8"
Excellent quality! Used it with a threaded steel tap-in-and-screw hole sink to connect taller wood "feet" (repurposed, cut from old bed posts) onto wood bed legs. Very sturdy! Actually makes a "click" sound when the machine end is fully screwed in. Loved that no glue was needed to make the connection feel secure. these could use instructions. 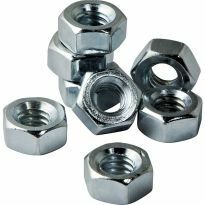 put on two nuts together tightly, then use the top one to turn these into the table corner leg, or whatever item you are attaching. Remove the nuts, and attach the leg or other item. 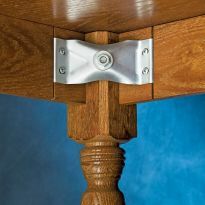 works great with the Rockler table corner brackets. These were a breeze to install! also self-explanatory. Easy to use if you pre-drill the hole slightly smaller. Quality product using good steel. 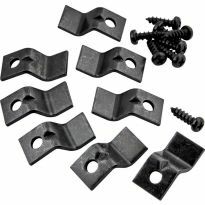 Don't forget these when ordering corner brackets. The bolts worked just like they are supposed to. Used these with the metal corner brackets. Just be sure you are installing them straight. Items as described, fast shipping, very satisfied!! Made a large oak dining room table for my daughter in law. I made to legs with 3x3 solid pieces and tapered them . The steel hanger bolts were the perfect way to fasten the legs . I can always count on Rockler . This was the first time I used these bolts, I used the 1/4&quot; ones. The pedestal for my table was solid oak, and very heavy. I used 2 per leg, ran them down. The legs were nice and tight. I also used them to fasten the table top to the base. Nice strong fastener!Easy to use! Used the three inch hanger bolts to enclose my deck for the winter they work great as sill anchors, and the tee-nuts makes it possible for easy assy of the walls for take down in the summer. Product worked with little effort or brain power. I followed the Rockler website provided data sheet and produced extremly tight studs with no split legs. Threads clean, easy start. Good price. 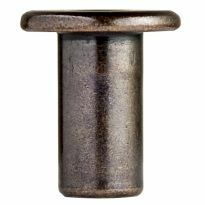 I have now used over 400 of these hanger bolts for a Arkansas Children's Hospital project without any problem. Always used the insert tool when screwing bolt into wood. Bolts worked great. But I didn't know what size hole I needed to drill in the wood before I installed the bolt but I figured it out. Great hardware. These bolts with wing nuts were perfect for my use for Hurricane panels. The anchor bolts worked as described but needs to be grabbed firmly to screw in place. I used a vice grip in, what I thought, was a firm but not overly tight grip. But the metal threads are soft and distorted making the wing nut difficult to use. I used (8) 3/8" steel hangar bolts along with 4 of the largest (34303) double-bolt brackets also from Rockler, nuts/washers (separate), and #10 x 3/4" screws (separate). I did not use any joinery or glue between the apron and legs, just the brackets, and it is very sturdy. Only downside is that they are raw metal and slightly dirty/oily. There is no paint or coating of any type. This may be fine as I do not expect them to rust heavily, but they may have to be prepped and coated depending on your project. These worked well driven into the 21" maple legs we purchased and used on a small specialty table. Product page doesn't make it clear these come in packs of 8. Didn't know whether I would need 1/4&quot; or 5/16&quot; so ordered 4 of each. Now I have 64 hanger bolts to install 4 muffin feet with.Editor's note: We note the package quantity on the &quot;more info&quot; page of this offer Tom. Return can be made on the extras you ordered. Perfect for my handmade coffee table legs but difficult to seat far enough in the oak without stripping the threads. It would be nice to have a 'non-threaded' section between bolt and screw threads to get a pair of vise grips on for turning. 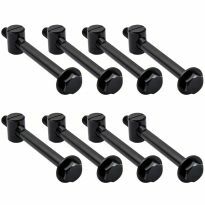 I need 6 hanger bolts for my project and ordered the ¼ x 3 in. option. The machine end threads are not finished to the ends of the bolts on 3 in the package of 8. I was able to force the star knobs on to 5 of the bolts, but they don't work as they should. Quality control missed this batch. This is the best way to put table legs on tables. using as hurricane panel bolts. Will use to secure carving to a base. I had to repair a bed. To hang a skeletonized clock on a wall. Need to install hurricane wood shutters. Because there are not alot of apron leg brackets out there, and most of them are not as well made as Rockler. most furniture makers would also be surprised to find Rockler coming in at half the price of the most available bracket out here in Ca. 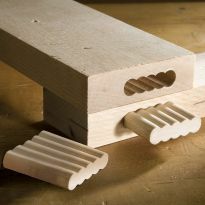 and just one bracket is more than 1/2 for what Rockler asks for four! I make furniture that goes outside, for Weddings etc. Everything I use is the highest quality that I can find, and oh yeah ..... here's Rockler! Quality looks good and ordering was easy. Building a table and chairs for my grandson. Well, need 'em for attaching the legs (which I'll make from 8/4 red oak)! What size wing nuts work on the 3/8 hanger bolts? how many bolts in a pack? 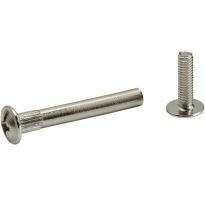 Is there a tool or machine to install hanger bolts? Simply use 2 nuts of the same thread size as the threads on the machine end of the bolt. Let's say you have a 1/4 x 20 threads on the machine end and wood screw threads on the other. 1) Twist on the first 1/4 x 20 nut to the machine end, and follow it with the 2nd nut. 2) Using 2 wrenches, tightly jam the nuts together somewhere along the machine end of the bolt. Be sure they are very tight. 3) Now you can use a socket wrench on the outermost nut to drive the wood screw end into the wood. 4) Finally, remove the jammed nuts by reversing the process using 2 wrenches again. Be sure to drill an appropriate pilot hole before you drive the wood screw into your project. I also lubricate the wood threads with wax or soap or paraffin to mitigate the possibility of the screw breaking off. one method is put 2 nuts on the machine threads. Tighten them together so they are jammed against each other and use a wrench to tighten the bolt. The wrench must be across both nuts so they can't turn independently. Remove them separately when you have finished. You will probably need to drill a pilot hole in the wood before you install the hanger bolt. 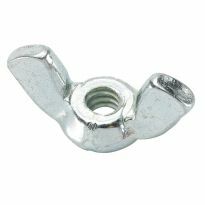 Do you have a clinch nut to accept your 24448 hanger bolt which is 3/8” diameter? I need these in a 5" length! Any ideas? BEST ANSWER: I have never seen these that long. However, you could extend the machine end by using a thread connector from your local hardware store. They look like a very long hex nut. They are meant to connect 2 sections of threaded rod. I can imagine you might have to do some cutting to get the length you need. I hope that makes sense. If you need longer wood threads, I don't have any ideas for that end. I found some! Thank you for your response. Great to hear it! Thanks for telling us. Rockler customer service is awesome! Give them a call. They were super helpful to my getting the correct hanger bolts for my project. However, if they can't help you, why not try googling "5 inch steel hanger bolts"? If you need a very long hanger bolt, you could get the right sized lag bolt, cut off the head and thread the shaft. Just a thought. I need #3 metric hanger Bolt Do you have?? 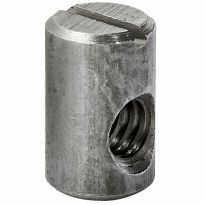 The 3" 24463 hanger bolts spec shows a 1/2" unthreaded center but the picture shows no unthreaded area, which is correct? BEST ANSWER: Nick, I've used these hanger bolts for a number of tables that I've built. I'm not sure there is much quality control regarding the transition between the machine threads and the wood threads. Some have larger unthreaded transitions, others don't. The "1/2 inch" of unthreaded area is inconsistent on the bolts, but that has never been an issue with me installing them. Nick, I just measured the hanger bolts that I used on my wife's studio table. There is at least 1 1/2" of machine threads on the bolt as well as 1 1/2" of wood threads. Get the longest ones and if they are too long, you can always cut the machine bolt side to fit your application. 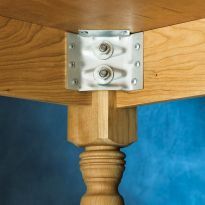 If you are going to use the metal corner brackets that Rockler sells, there is plenty of thread to attach a table leg or whatever. I hope this helps. 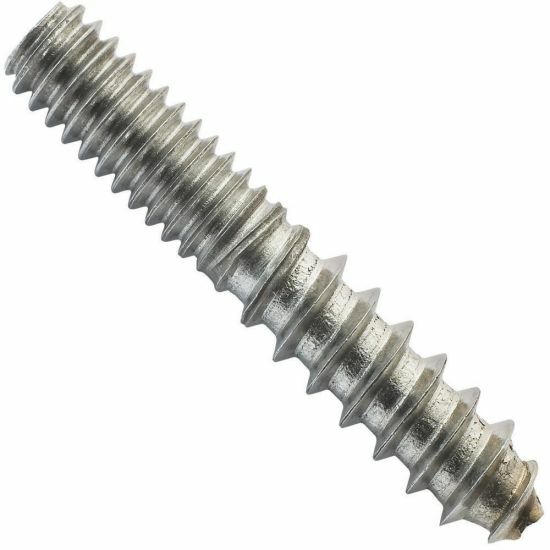 RE the 3" by 1/4-20 bolt- how long is the wood screw portion and how long is the machine screw? I need a hanger bolt that has the coarse wood threads on BOTH ends to repair my wood cane. What do I call this? BEST ANSWER: Double ended wood to wood dowel screw. I'd also use a good wood glue. Good luck on your project.